At the time, it was the latest craze, the biggest cash cow, milked for all it was worth. From the moment the Teenage Mutant Ninja Turtles first appeared on TV, they were hot property and tie-ins of every nature began to appear. Action figures, medal collections, fancy dress outfits, a movie and the inevitable computer games... and, like The Simpsons, there have been quite a few. 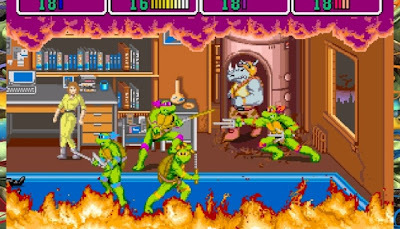 In fact, there’s a lot of parallels you can draw between the Turtles and the Simpsons, especially when it comes to the arcade games that were released. Just a quick pointer for any international readers here, over here in the UK we went through a period of ridiculous censorship on anything relating to Ninjas or martial-arts especially when it came to computer games. Games like Shadow Warrior, for example, had shurikens (throwing stars) removed and replaced with… erm… darts. 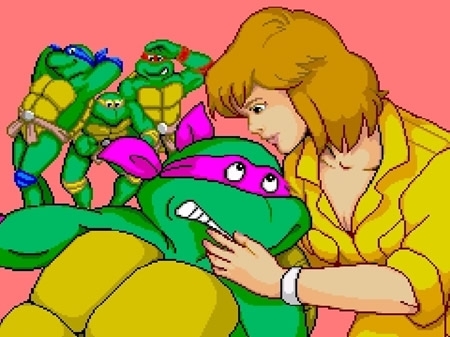 Therefore for the Teenage Mutant Ninja Turtles (hereafter referred to as TMNT) cartoons, most footage of Michaelangelo fighting with nunchuckas or flails or whatever you want to call them was edited out for the UK. Even the title had to be changed (and the theme music re-edited) to “Hero” rather than “Ninja”. Why? Don’t look at me, I don’t make the rules. 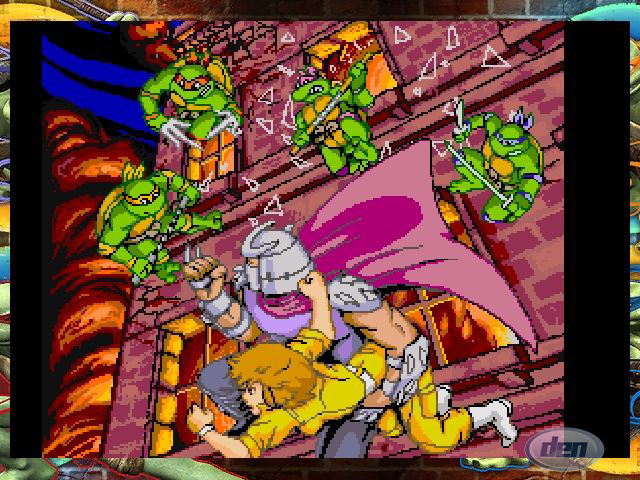 Fortunately Michaelangelo was allowed to fight as he pleased in this, the Turtles’ first appearance in arcades. Bearing a striking resemblance to the old Gauntlet cabinets, the original TMNT arcade machine was one of the first to introduce the Credit Assign button. Rather than having 4 individual coin slots, there was just one. Once you had inserted sufficient funds (or “stuck yer coins in” if you prefer layman’s terms) the “Credit” buttons started flashing. Pressing the relevant button would assign a credit (and the correct number of lives) to that player. This was a good idea, in my opinion, as it prevented people unscrupulously pinching each other’s credits (and yes, as a youngster, I had done that in the past, which, given the chance, I’d like to apologise for!). Before I get onto the game, it’s worth pointing out how the value of the game changed over the years. When first released, most arcade games were only 10p a play (and fruit machines weren’t overly popular), the 20p rate was often reserved for either new games or the real “big name” games. Naturally this game went straight in at the 20p rate, however most of them were immediately set to 1 life per credit. As time went by and 30p rates started to appear, these were often upped to 2 or 3 lives with it. Of course, there were arcades in Newquay that proudly advertised “All Video Games 10p per play”, GUARANTEED these were set to 1 life only. As usual, there were the bonus credits, so sticking 50p in the machines set to 20p play would get you 3 lives, and a quid would get you 7, from that point of view it wasn’t TOO bad for value. Right, onto the game, then… By the hell, it was good. The graphics were absolutely outstanding, the sound and music superb, and with sampled speech too? Awesome. 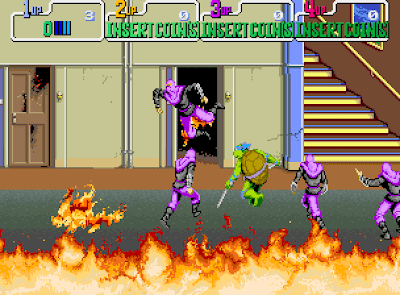 Naturally, the main part of the game was a standard side-scrolling beat ‘em-up, and each player took one the role of one of the Turtles. 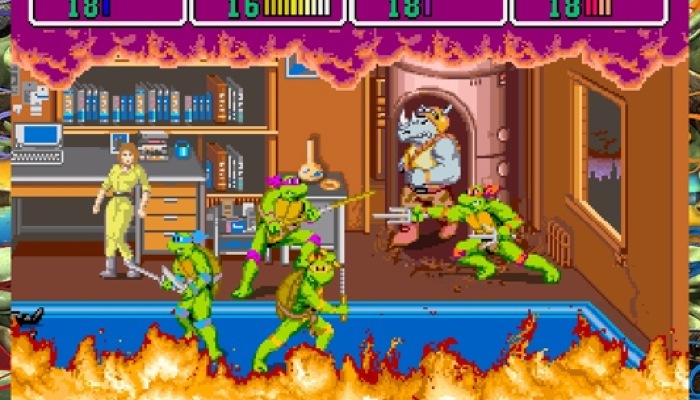 Each had their strengths and weaknesses; Leonardo and Michaelangelo had the strongest attacks with a medium range, Donatello had weaker attacks, but his bo staff had the longest range, all three used the “Jumping swing” as their special attack (often a one hit kill, activated by pressing “Jump” and “Attack” simultaneously). However, Raphael was slightly different. On foot his attacks were very fast, but had the shortest range (Bringing Sai to a gunfight? D’oh! ), but his special was far better than the rest, he would roll and do a sliding kick. Whilst it didn’t often get a one-hit kill, it was very useful for scattering the enemy when things start getting very hectic (the boss fight against Baxter Stockman and the Mousers in particular is a fine example). The most common enemies were the Foot Clan. All robotic, the colour of their uniform gave you an idea of how they were likely to attack. Many carried no weapon, others carried boomerangs, swords, guns, spears, or even drain covers. With good references to the cartoons, other enemies included the “Capture” robots (the ones with the lassos that capture the Rhino and Warthog to make Rocksteady & Bebop), Mousers, Rocksteady & Bebop, Baxter Stockman, Krang, Shredder and Krang’s Rock Soldiers from Dimension X.
Tactically the game was mainly about timing your attacks to get the first hit in. Most of the time, getting the first hit was key to winning a one-on-one fight, but there are a few exceptions. Bosses can’t just be duffed up, you need to get a few hits in and then move away as they WILL counter, and then go in to hit them again for a knockdown. Like a lot of beat ‘em-ups, there were some moments of extreme frustration. 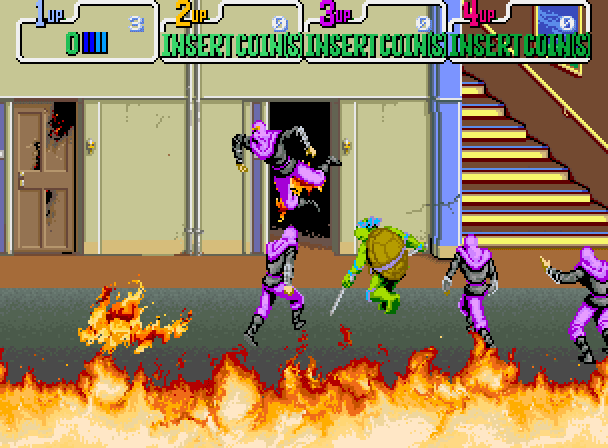 The battle with Shredder, for instance… As well as his sword, he also carries a mutagen ray, which will turn you back into a regular turtle on contact, immediately losing you a life. Yes, that’s right, one hit from that weapon could effectively cost you 20p to continue right there and then. In terms of backdrops and scenarios, all recognisable areas from the cartoons are present, including April O’Neill’s apartment, the Sewers and the Technodrome. But there’s one feature I haven’t really talked about yet, which adds so much to the whole experience. The sound. The wonderful, wonderful sound. It’s awesome. From the excellent music throughout to the sampled speech and awesome 90’s-style effects used in battle, the game simply oozed awesomeness in every clang, crash and kaboom. In fact, once again, thanks to Galbaldia Hotel, I’ve downloaded the soundtrack and it goes very nicely in the car. 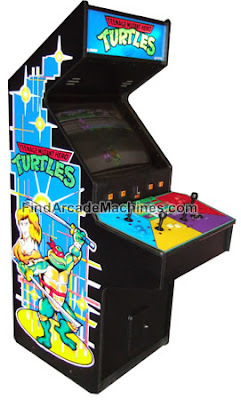 I know I mentioned the huge 4 player cabinet, but there was also a 2-player version where you could choose your Turtle, but for obvious reasons that was never going to be as good as the full 4-player experience. 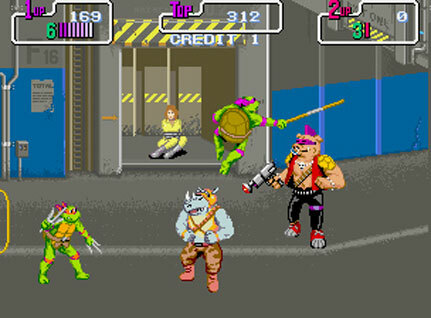 The game was followed up by at least one sequel, and another version hit the arcades as part of Nintendo’s multi-choice time-limited games system, but apart from the almost identical clone, The Simpsons, not much came close to the success of the original TMNT arcade game. Turtle Power!